The kidneys filter wastes from the blood and make urine. When the blood vessels that supply the kidneys with blood narrow, it’s called renal artery stenosis. 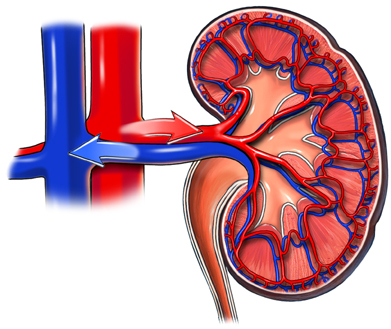 The narrowing lowers the amount of blood flowing to one or both kidneys. Problems in both can lead to kidney failure . The kidneys control blood pressure. They help make sure the body has enough oxygen and blood. Narrowing causes blood pressure to go up. High blood pressure is a leading cause of stroke and heart attack . Renal artery stenosis. EBSCO DynaMed Plus website. Available at: http://www.dynamed.com/topics/dmp~AN~T115312/Renal-artery-stenosis . Updated September 8, 2017. Accessed June 11, 2018.